NOAA's Suomi NPP satellite passed over Tropical Storm Fiona as it was being weakened by wind shear in the Central Atlantic Ocean. On Aug. 22 at 12:10 p.m. EDT (16:10 UTC) the Visible Infrared Imaging Radiometer Suite (VIIRS) instrument aboard NASA-NOAA's Suomi NPP satellite captured a visible light image of Tropical Storm Fiona before it weakened into a tropical depression. At the time of the image, Forecaster Daniel Brown of the National Hurricane Center noted that "strong westerly shear continues to take a toll on Fiona." The Suomi NPP image showed the bulk of Fiona's clouds pushed to the east. "After becoming devoid of convection overnight, new convective cells have developed around the small circulation, but there is not much organization to the thunderstorm activity," Brown said. "Besides, the clouds tops are already being sheared eastward by strong upper-level westerly flow." The tropical storm weakened into a depression at 11 p.m. EDT on Aug. 21 (0300 UTC, Aug. 22). 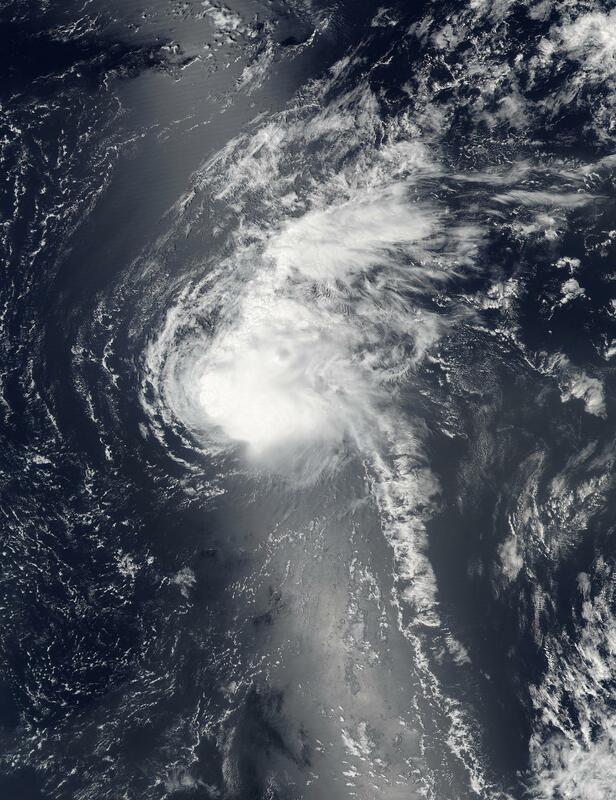 By 5 a.m. EDT (0900 UTC) on Aug. 22, the center of Tropical Depression Fiona was located near 24.4 degrees north latitude and 58.4 degrees west longitude. That's about 525 miles (855 km) northeast of the Northern Leeward Islands. Fiona was moving toward the west-northwest near 18 mph (30 kph) and the National Hurricane Center expects a continued west-northwestward motion with a gradual decrease in forward speed today, Aug. 22 and Tuesday, Aug. 23. The estimated minimum central pressure is 1008 millibars. Maximum sustained winds were near 35 mph (55 kph). Little change in strength is forecast during the next 48 hours, but Fiona could become a post-tropical remnant low pressure area in the next day or two.